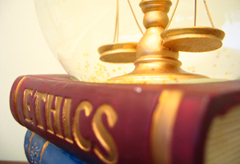 As forensic experts, a strong Code of Ethics is very important to our members and to our organization. All members must sign the Code of Ethics, and adherence to the Code is required for a member to be in "good standing" in the organization. Download the NADE Code of Ethics. If you have questions about the NADE Code of Ethics or the policies of the NADE Ethics Committee, contact Ethics Chairman Karl Schaffenberger, CDE.